I don't know about you but I'm feeling 22. I know it's cheesy but I felt it had to be done, you only turn 22 once. I can't believe how quickly the last year as gone and it's nice to be able to reflect on what has changed. This time last year I had the courage to leave a job which was affecting my home life as I wasn't happy and to find a new job which I love. I've flown the nest and live with my boyfriend and we are saving to buy our own house I've grown up a lot and learnt new things to make me a stronger and happier person. My Birthday Wish is to make the next 365 days in my 22nd year count. I want to visit new places with my boyfriend and continue looking forward to the future together and to continue to believe in myself. As for my Birthday my Boyfriend Ross has booked us two nights away to Colchester so I am off to Enjoy and I can't wait to blog all about it! I thought it was about time to put together a Birthday Wish List as It is my birthday in five days! (24th April) can you tell I am a little more than excited. I have been wanting a nice new bag for a while now I remember owning a really nice bag from River island and it was very well made lasting me a long time. I am not really one to look in or on the River Island site but I was surprised how many nice bags they had for this season. I fell in love with this pink, white, black and yellow strapped bag and also saw a link for a matching purse. I am a sucker for everything to match. The watch is also from River Island, I don't own a nice watch and I would love one and it's a really cute style. A fit bit to go with my new healthy and fitness related lifestyle, I just find them so fascinating. A cute quirky cupcake with a candle, just a little treat as I don't want a massive cake but I still want to blow a candle out even at 22. I love M&M's anyway but coming across Birthday Cake ones, I feel these are a must have! Lastly a full sized Roller Lash as I adore my sample from Elle so much and it has made a huge difference to my lash look. So as most of you have probably soon due to the change of my Twitter username is that Petite View has now changed to Tres Petite. When setting up my blog originally as Petite view it was one of the name I kind of settled on but never really fell in love with it. I have always known I wanted to keep the word "Petite" involved as this sums me up as I am only 5ft1 which I am proud to be after years of wishing I was taller so this word means a lot to me. 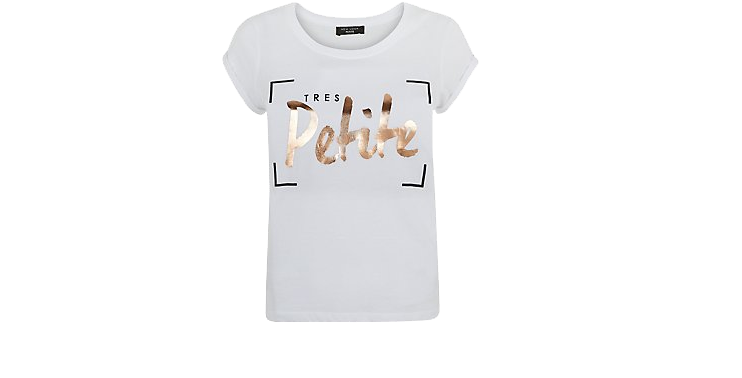 I have been writing and thinking about idea to link with this one words for a few months and then last night I was browsing the internet for Petite clothing and I came across this T-shirt from New Look. I instantly fell in love after going through the names like La Petite and more towards the cute quirky French words and I instantly fell in love! Therefore I feel as though I have found the perfect name to fit myself and my blog and I am so happy that I was internet shopping and came across this, the only problem now Is I need this T-shirt so badly!! 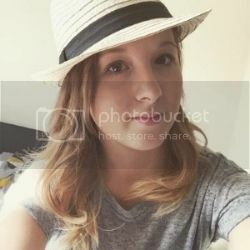 I would love to hear your thoughts on blog name changes and if you have done this yourself. 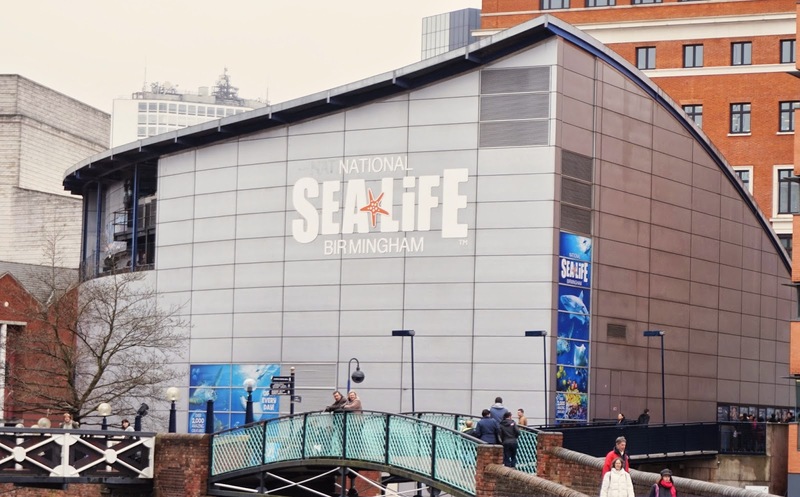 This week I visited the National Sea Life Centre Birmingham, making the most of my four day weekend and to spend some quality time with the boyfriend. 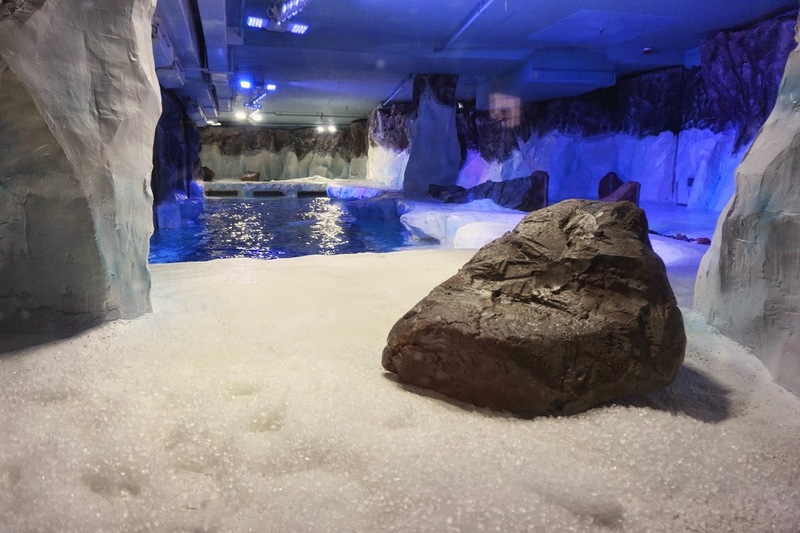 Now we have been to quite a few Sea Life Centres, normally if we are away near the coast and there's one nearby for something to go and see. 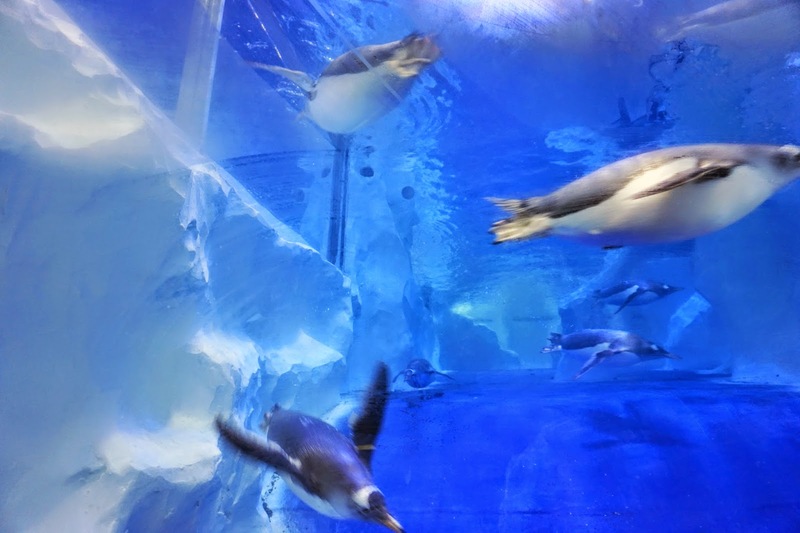 Myself and my boyfriend are big fans of fish anyway and I also get to see some cute penguins! They spent all of their time underwater on our visit. Almost like they were synchronised swimming. We followed the route and I like the way everything is separated into sections clearly marking what is in each area. We went on a Bank holiday so it was very busy but they did limit the amount of people by offering time slots of bookings which I thought was a very good idea to keep it flowing well when inside. 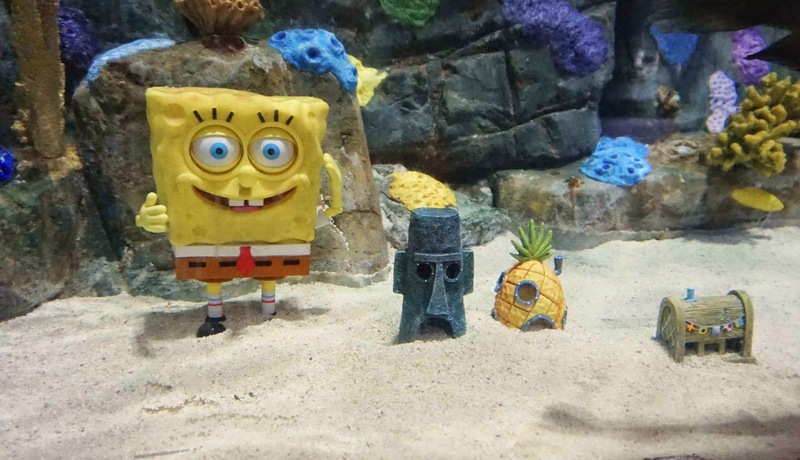 For the new Spongebob movie release they had a Spongebob hunt for the children to find and collect different stamps as they explored Sea life. Being an adult and a couple we didn't really take much notice of spotting all the characters but it was a nice idea and perfect for entertaining children if you have any. The price for an adult is £20.95 We were lucky to have a half price of admission voucher valid for up to five people which we used so always have a look online for special offers before you go. Overall It was a nice day out, but it only took us about an hour and a half to see the whole centre which was a little bit of a disappointment for the price of admission. In terms of size birmingham isn't the biggest centre so maybe next time we will see if there are any bigger centres to go to. 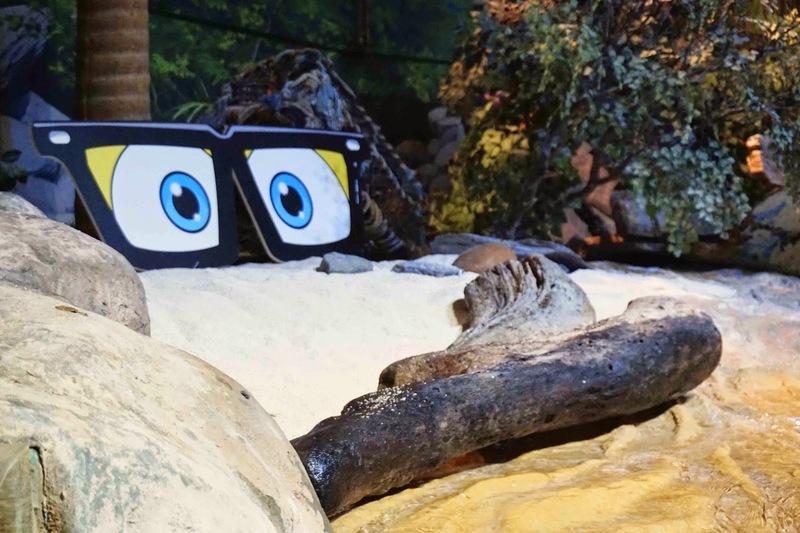 Have you got any thoughts of Sea life? This is one of the first books that I have read all the way through since childhood and I am so glad that I read this, It inspired me to get back into reading and how easy it is to imagine a different world to your own, taking all the words in and I love that for a moment you are imaging a different world to your own. Chloe Henderson has never been one to break the rules or push the boundaries… but during her summer break, she and her friends use fake IDs to sneak into a club. It’s there that she meets handsome and alluring bartender, Will Morris. The pair hit it off immediately, growing closer with every passing day. But as with every summer, it has to end sometime. A tale of forbidden love, broken hearts, friendship, and rivalry. Any fans of Pretty Little Liars will link this storyline briefly with Aria and Ezra, I was fortunate to read this book before beginning to watch PLL. But the start of the book is similar in the way the boy assumes the girl is around the same age and they instantly hit it off leading to them meeting again after Summer to find out that there new teacher is that guy! The book has many ups and downs for all the characters and It keeps you intrigued throughout. There are so many up and down moments for the main characters which keep you in suspense, will they won't they? 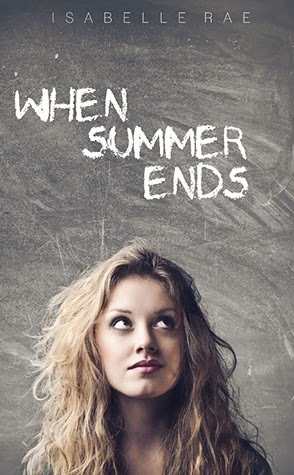 It was a doomed relationship from the start when Chloe went back to school, it was heart breaking when reading about all the dates they had in the summer, Will was just the perfect guy, romantic, gorgeous and funny. The story is like a rollercoaster, having so many up and down emotions, even I felt their emotions when reading it. I really enjoyed reading this book mainly about "Forbidden Love" I don't want to spoil the book for everyone but it is a great read and I am so glad I came across it. I haven't tried out any nail art for quite a while so I decided to give it another go with an Easter theme and I am really happy on the outcome. I started with a base colours of pink, white and blue to keep it nice and spring like as I am not a big fan of yellow. 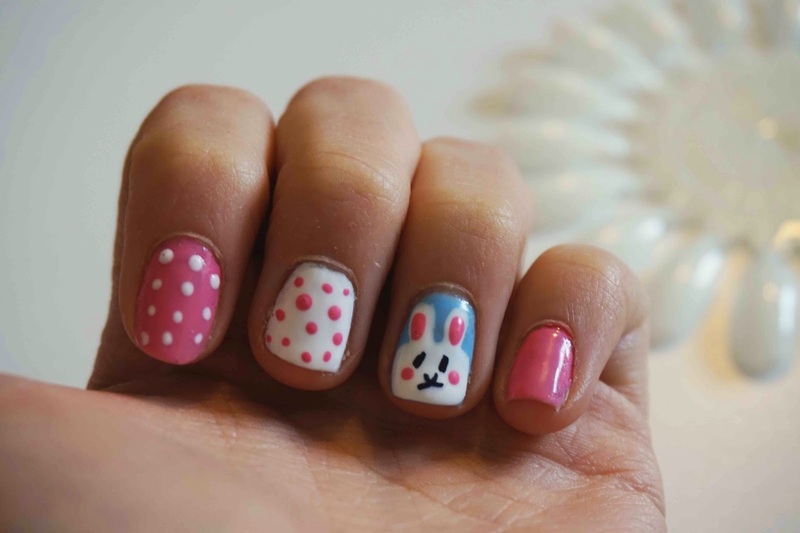 I used a fine nail art brush create the bunny outline. I used a dotting tool to add the pink bunny ears and cheeks and a black sharpie for the eyes and nose which I find easier for small details. I also used the dotting tool to make my pointing and middle nails spotty just to add a little more detail to my nails. 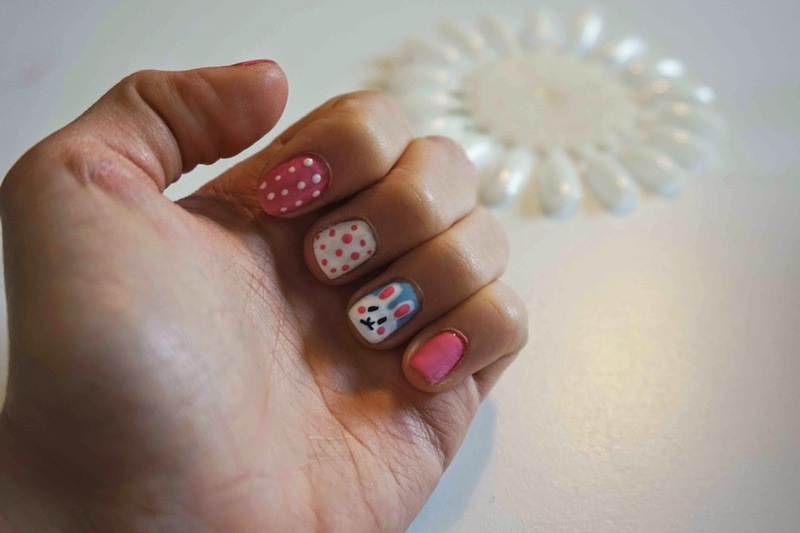 This is the final outcome and I am quite happy for my second attempt at trying to draw anything onto my nails, it may not be the best bunny ever but It's still cute! 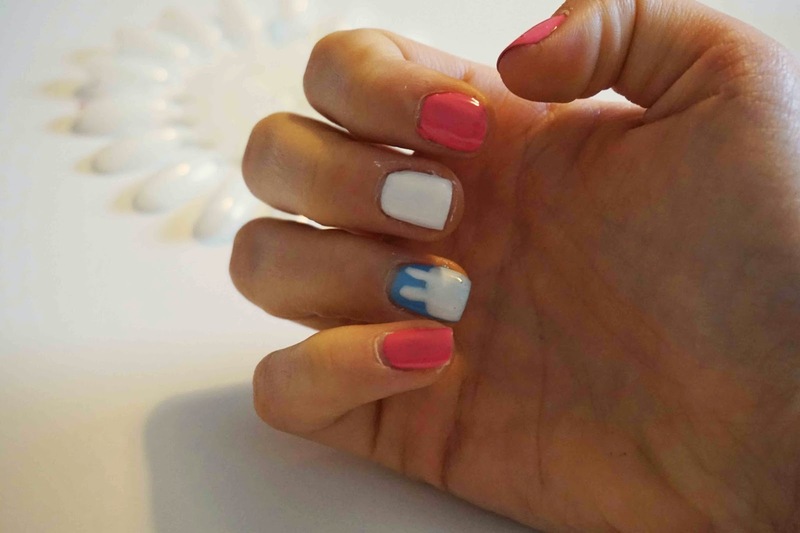 Are you painting your nails for Easter?